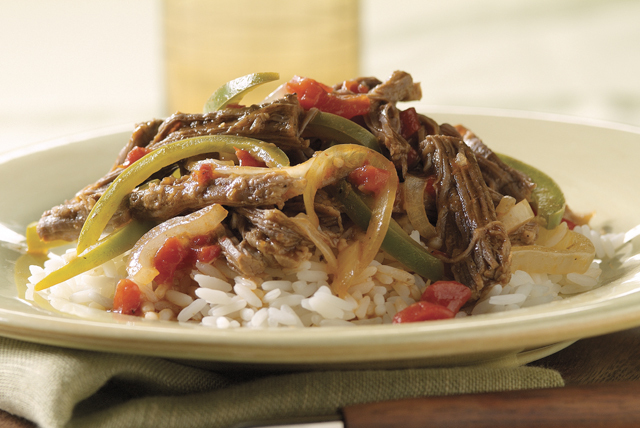 Make a great impression with our Ropa Vieja Recipe. This Ropa Vieja Recipe is a Cuban dish named for the shredded meat's resemblance to torn clothes. Place steak and half each of the onions, green pepper halves and garlic cloves in Dutch oven. Add water and bay leaf. Bring to boil on medium-high heat; cover. Simmer on low heat 2 hours or until steak is tender. Cut remaining onion and remaining green pepper halves into thin slices; place in large skillet. Finely chop remaining 2 garlic cloves. Add to skillet along with the dressing; mix well. Cook on medium-high heat 10 min. or until vegetables are tender, stirring frequently. Drain steak mixture, reserving 1/2 cup cooking liquid for later use; place steak in shallow pan. Discard vegetables cooked with the steak. Use 2 forks to shred steak. Add to vegetable mixture in skillet; mix well. Cook 2 min. Stir in reserved cooking liquid and remaining ingredients; cook 5 min. or until heated through, stirring occasionally. Cuban in origin, this dish is popular in many Hispanic countries. It got its name because the meat is shredded (like old clothes). In some countries, it is called "torn clothes." The broth which the meat is cooked in makes a great base for your favorite homemade soup. Or for added flavor, use it instead of the water when cooking rice.